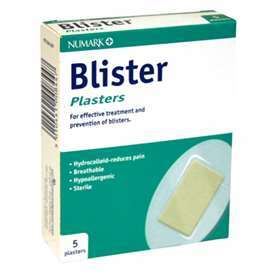 Numark Blister Plasters - For the effective treatment of blisters and the protection of areas prone to rubbing, such as the back of the heel, from blistering. The hydrocolloid particles within the plaster interact with the natural secretions of the skin to create an ideal healing environment around the blister. This speeds up the healing process and reduces pain. Clean and rinse the wound and the surrounding skin. Dry the skin thoroughly for effective adhesion. Peel open the plaster wrapper and remove the backing papers from the plaster. Do not touch the adhesive surface. Apply the plaster firmly but gently. Warm the plaster with your hand to aid adhesion. Do not remove the plaster until it becomes loose. The plaster will loosen naturally when it requires removing or replacement. Do not use after the expiry date, see base of pack. Do not use if individual wrappers are torn or damaged. If the wound does not appear to heal or continues to bleed, seek medical advice.